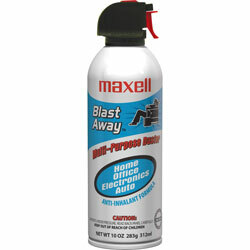 Canned air is an all-purpose duster. Removes dust and dirt off keyboards and electronics. Ideal for sensitive home and office environments. Contains a bitterant to help discourage inhalant abuse. Canned air is nonflammable. Blue, White Air Dusters from Maxell! 494 In Stock today. It is the only canned air that we use! It is all that it says it is. It is the only canned air that we will use.